Hi there! I ended up taking last week completely off from blogging. Ryan had the week off, so I took the week off as well from most of my work. A mid-year vacation is exactly what we both needed – we went camping twice, watched a bunch of movies, and relaxed. Two weeks ago (the last week of June/first week of July) was one of the best weeks of training I’ve had since the start of my off-season. I threw in a few harder runs and felt great. I did not follow any training plan during the week of the Fourth of July, but rather I ran a few miles each day. 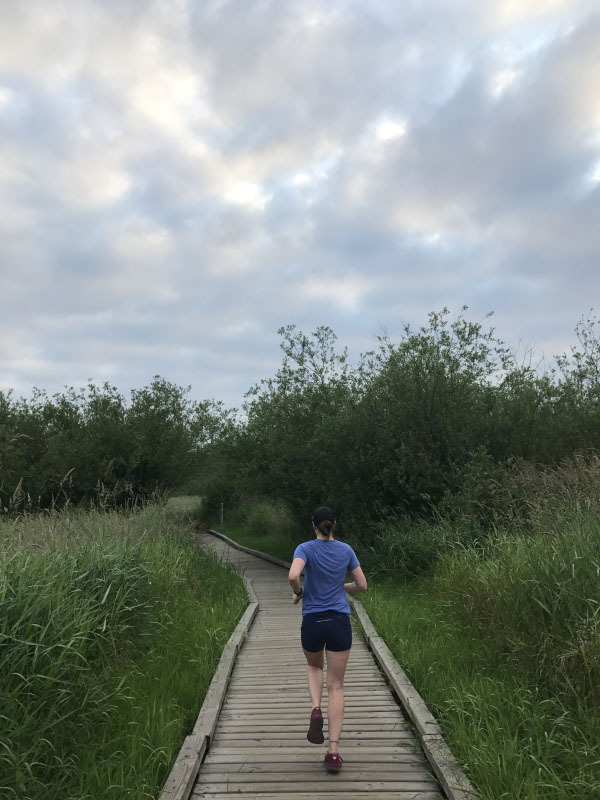 Rather, last week was running and camping on repeat – leaving me both mentally and physically relaxed for the last month of base building before marathon training begins at the start of August. 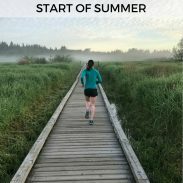 I headed out for an early morning run with Ollie and decided to test how well he can hold a faster pace for longer. We ran at a comfortable pace for the first 3 miles and then I increased our effort to threshold pace for the final 2 miles. The first of these 2 miles was 7:17 and the second clocked in at 7:28. 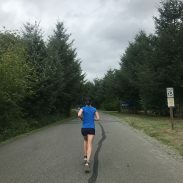 There’s one hill near the end of this route with a corkscrew curve, which consistently slows me down – so considering that, I was proud of my last mile pace! Ollie, meanwhile, was simultaneously thrilled and tired from this run. I honestly can’t remember much about either strength training or the run – and that’s part of base building. It’s not glamorous or always social media worthy, but those miles and time at the gym pay off over time. Seven mile runs are my favorite distance, especially early in the mornings when getting up a bit earlier means catching the end of the sunrise. I paced Ryan through a tempo run. We both are slow to warm up, so we warmed up for about 15 minutes and then did 3 miles at 8:11, 7:48, and 7:59, followed by a short cool down to 5 miles. My GPS watch died after 1 mile and honestly it was a bit liberating to do an easy run without my watch beeping at my each mile. We kept the pace very easy – around a 9:35/mile average, based on Ryan’s watch. I kept my strength training short with basic movements: hinge (single leg deadlifts), squat, pull (assisted pull-ups), push (elevated push-ups), and plank (forearm and side). 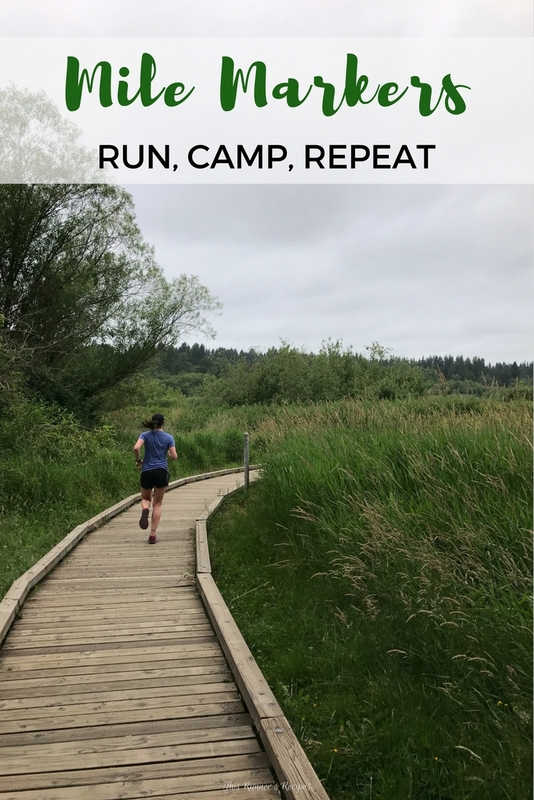 The runners I coach will tell you that one of my favorite workouts is progression long runs. 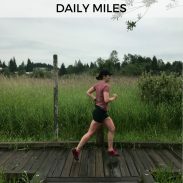 I’m coaching Ryan through training for his first half marathon and this week’s long run was a 10 mile progression run with the last 2 miles at hard effort. We ran the last 2 miles at 7:35/mile pace. Ryan and I brewed our first batch of beer! The whole brewing process took about 5 hours, although not all of it was hands-on. 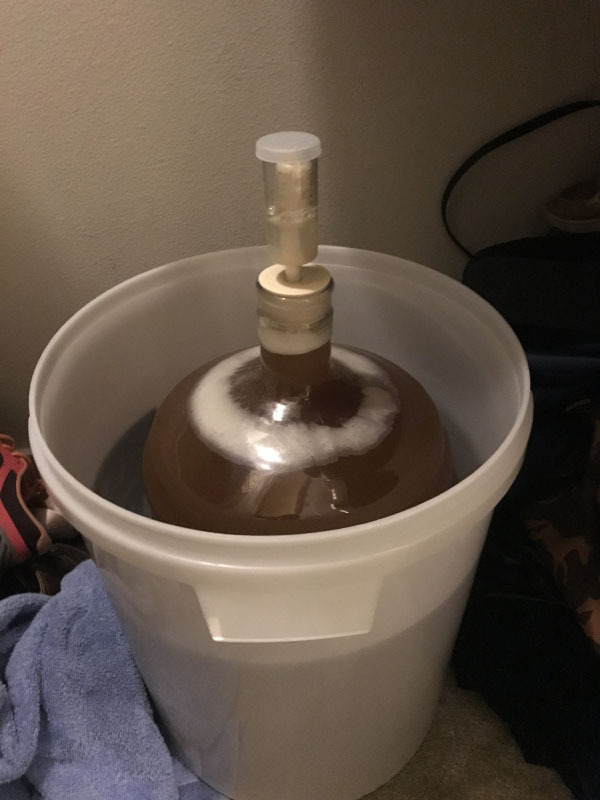 Homebrewing is an fun process, although the final stages are intimidating because everything has to stay sanitized. We passed the time between stages by watching Harry Potter movies. The Harry Potter series defined my young adulthood – the first movie came out when I started middle school and the final movie was released in the summer before my senior year of college – and we both love rewatching the series. Another easy run with both dogs! I felt like I only had one gear on this run. Do you ever have those runs? My pace was within my normal easy pace range, by my legs felt sluggish. We were running later than I’m used to and the combination of the sun and warmer temperatures seemed to sap my speed. We decided to backpack for the Fourth of July but we were nervous about being able to find a campsite. The trailhead was crowded, but almost all of the people were day hikers. We had a lakefront campsite completely to ourselves and let the dogs play in the water. Ollie has been hesitant to swim up until this trip. 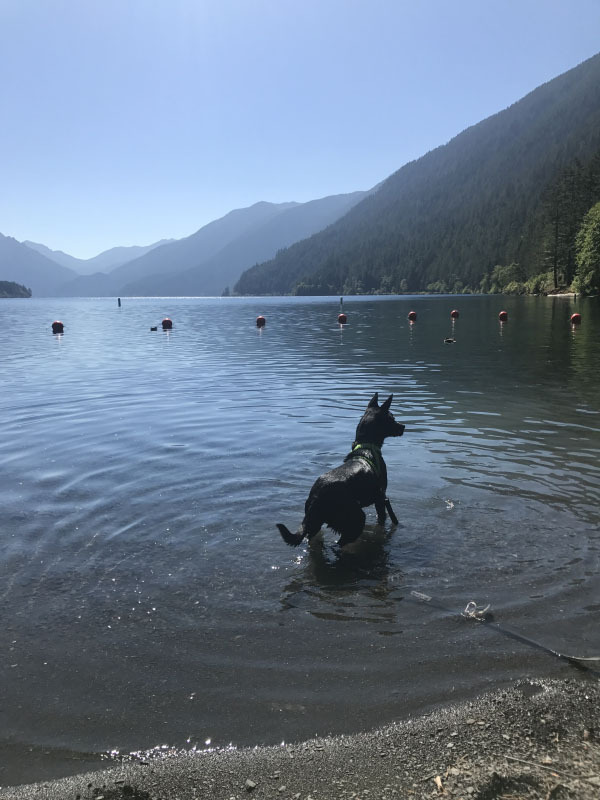 We threw a stick in the lake for him to fetch and he discovered that he could swim – and that he liked to swim. By the end of the evening, he was swimming several feet out! His grand achievement was ripping a four-plus foot branch off of a downed tree and swimming it to shore. He was so proud of himself! After a leisurely breakfast by the lake, we packed up and hiked back down. The return hike is always so much easier with less weight in the packs and the aid of gravity. After a backpacking trip, my legs always feel a bit heavy on the first run back. We kept this run light – the focus was just running, not hitting any pace or mileage. 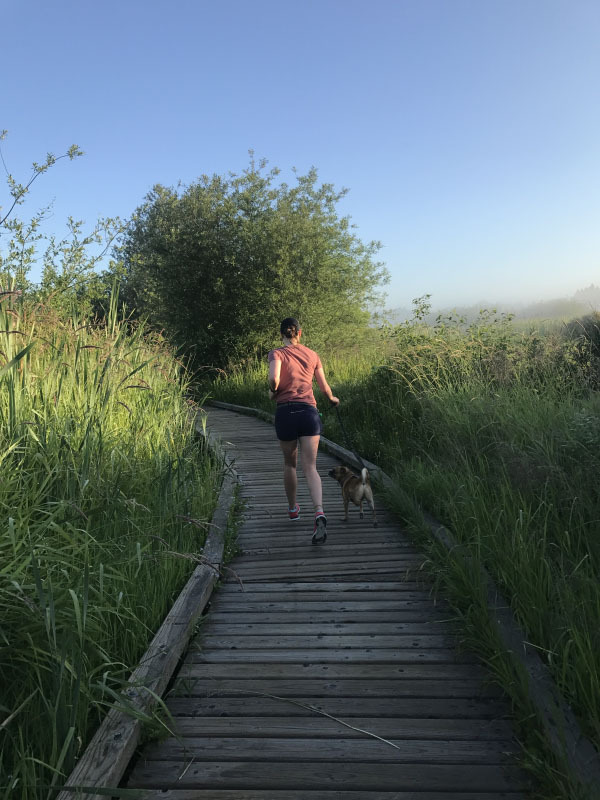 I took Ollie out for a quick run before we headed out to the Olympic Peninsula for a camping trip. I pushed him a bit and we ran a steady 7:34/mile pace for 3 miles. I’m not used to running that fast without a warm-up and my legs felt a bit off for the first quarter of the run, but then the pace felt good. 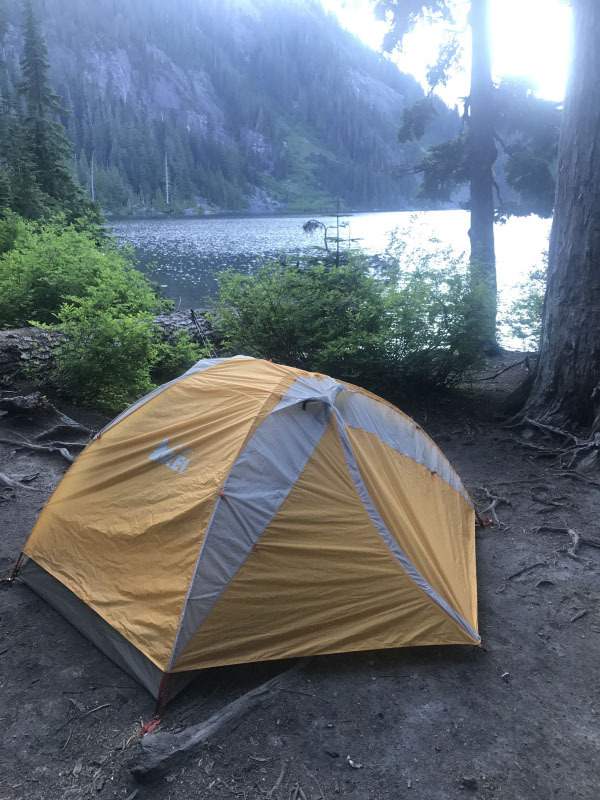 The campground on Lake Crescent was completely packed, so we camped in the Olympic National Forest. We car camped, so the entire trip was leisurely – smores, brats and beer, and a campfire. After leaving our campsite, we took Ollie to Lake Crescent for some swimming. 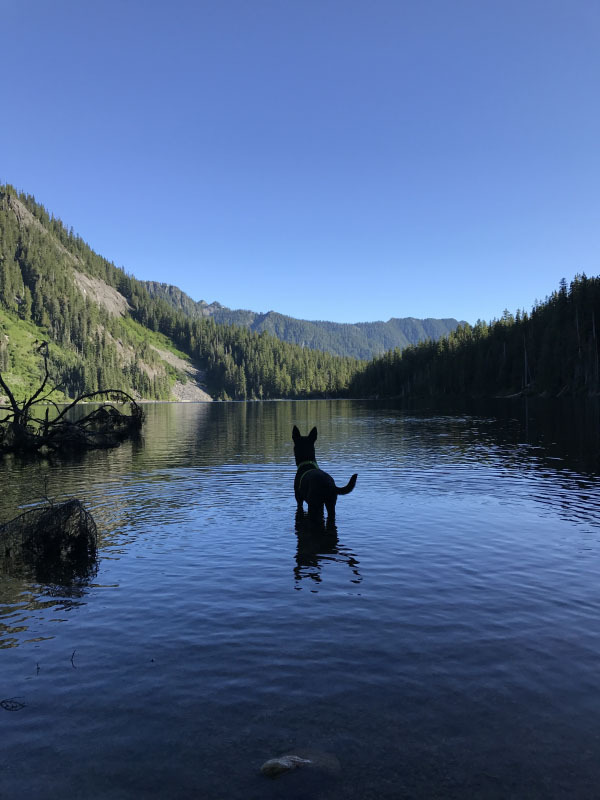 Dogs have to be leashed in National Parks, so he couldn’t swim far, but he spent half an hour fetching sticks and treading water. We tried to get Charlie to swim, but puggles aren’t as inclined to water as Labraheelers! After church, we took the dogs out for a short run. It was later than we normally run and the difference in the heat and sunshine was significant! Both dogs seemed a bit affected by the heat, so we kept the pace easy. How did you celebrate the Fourth of July? Welcome back! Im glad you had a relaxing week off with some good runs. Its been pretty warm around here but as long as I get out early enough its not too bad. Thank you! Getting out early makes so much difference in summer – at least the sun is up earlier! Sounds like a wonderful vacation! That pic of Ollie is so cute. My week in workouts wasn’t glamorous but I got it done. Thank you! Getting it done is what matters – lots of training really isn’t glamorous! 8 Miles used to be my favorite, because it was just past the hour mark, so I got the mental training of that, but it was still basically just an hour. NO LONGER. Right now, 4 milers are jamming for me, though I would like to make 5 milers more effortless. Whatever, I’m just enjoying being out there! Just being out there is the best of all! I was wondering where your posts were last week, but it looks like you had a wonderful vacation. I’m glad you got some runs and hikes in but don’t blame you to just take it easy- after all, it is vacation and we all need a break sometimes! Thank you! 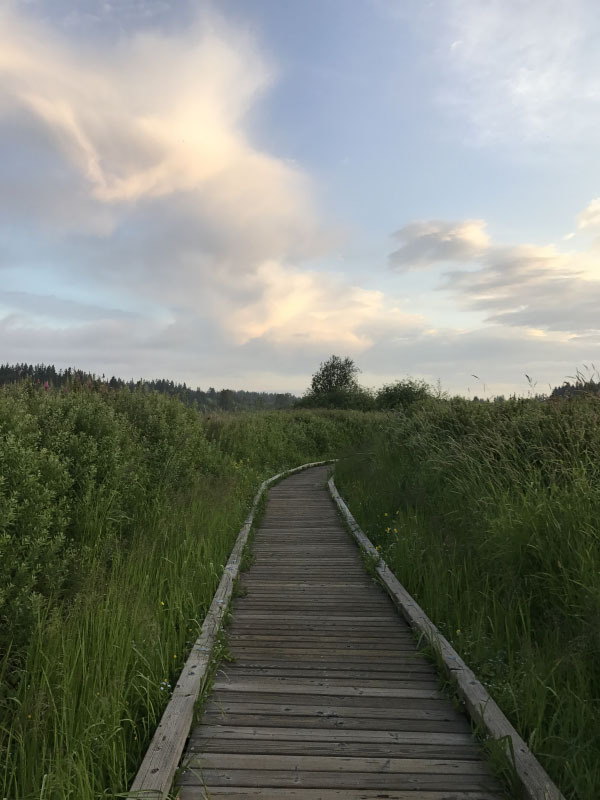 I wasn’t planning on taking the whole week off from blogging, but we were out of connection so much that it just made sense. An unplugged vacation is always nice! so glad you had a nice week off, welcome back! Glad to have you back! I’ve never read or watched any of the Harry Potter series. Crazy, eh?! What a great 2 weeks of running and I’m glad you guys were able to take some time off work together. Oh my gosh you should read them and watch them! They are the type of book that reads well at any age. Sounds like a wonderful, relaxing week! We went to the Oregon coast for the 4th. Thank you! The Oregon Coast sounds like such a fun trip! I absolutely LOVED the video of Ollie and the tree branch in the water – so hysterical! Star also loves the water and will now fetch balls and floating toys so it’s fun for both of us. I cannot fathom how amazing it must be to be able to hike and then just camp by the lake. I really need to get myself out to the Northwest and experience that!! That is so cute how Star loves the water! It is amazing to hike and camp right on a lake – you do need to come out here to experience it! That backpacking trip sounded awesome! My dog is also hesitant to swim (which is so silly to me because he’s a lab mix) but I’m hoping one day it just clicks for him like it did for your dog!